I am back in the UK for a couple of weeks. Next up for me is WebConf.asia in Hong Kong, I'll be speaking and also running a full day workshop. This week we have browser news from Chrome and Firefox, SVG pointer events, the backdrop-filter property and progressive enhancement. Thanks to Smashing Conf for sponsoring this week. I'm speaking in Toronto at this "no slides allowed" event, perhaps I'll see you there! "Good news of the day: The latest @FirefoxNightly build has a fix for display:contents accidentally nuking the accessible role and affecting its children in the process. Thanks to @hdv for filing! https://t.co/UkyvVgj9lb. Firefox 62 will be out in August and contain this fix." All the details of what is new in Firefox 61: Developer Edition. Includes performance improvements for CSS, the new Accessibility Inspector and improvements to DevTools. The Intent to Ship for CSS Scroll Snap in Chrome, with details of a phased implementation. Tiffany B. Brown takes a look at how to shape the interactivity of SVG images, controlling which parts of the document can receive clicks, touches, or taps — using the pointer-events property. An explanation of the CSS backdrop-filter property. As I talk about new layout I often answer questions from people worried that they can't use any of these techniques because old browsers - usually meaning old versions of IE - exist. This article argues for the similar middle ground approach that I recommend. Taking advantage of new features while still providing a good experience to those locked onto older browsers. A useful talk from Google I/O showing how to use Lighthouse and DevTools to fix performance problems. What would be the best way to learn and improve your skills? By looking designers and developers over their shoulder! 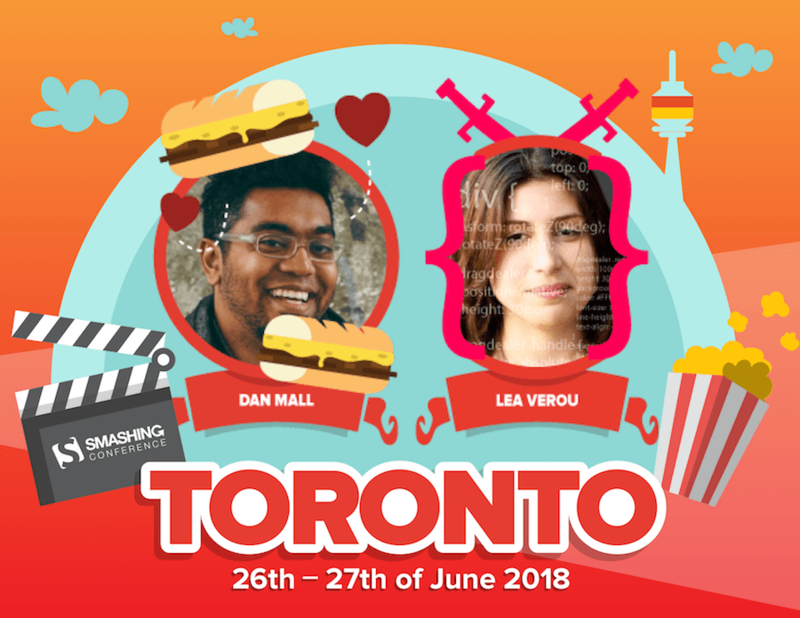 At SmashingConf Toronto taking place on June 26–27, they will exactly do that. All talks will be about running live coding and design sessions on stage, showing how speakers such as Dan Mall and Lea Verou, yours truly, and Sarah Soueidan design and build stuff — including pattern libraries setup, design workflows and shortcuts, debugging, naming conventions, and everything in between.